Over the past one week, I have been vehemently searching for this one product in the supermarket but I couldn’t get hold of it. It was out of stock every time I was checking out the dairy section. 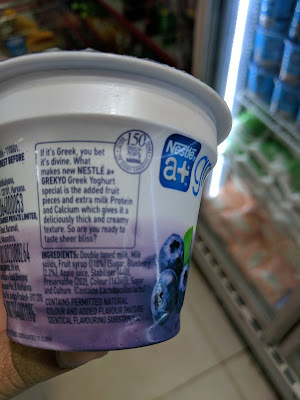 The motive was not to buy and taste it but to check out the ingredients list :-) Yes, I’m talking about the widely promoted Greek Yoghurt. 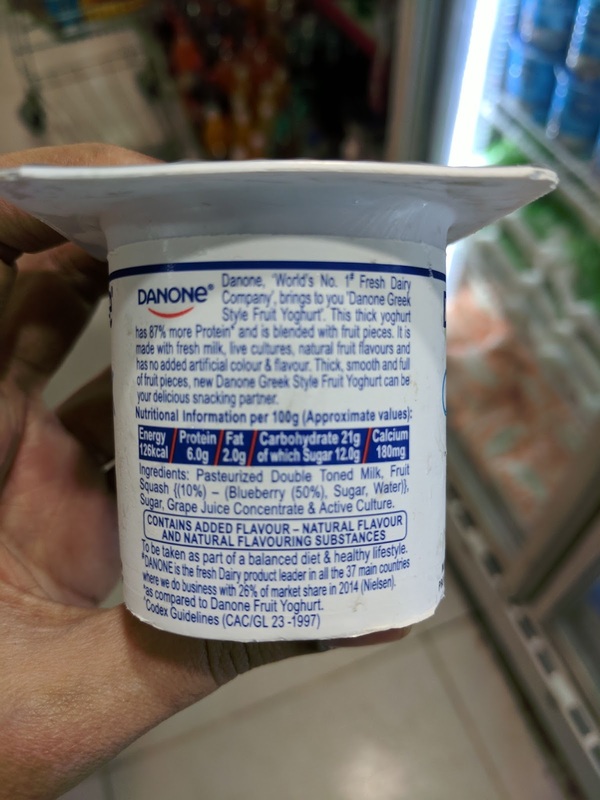 It’s anyone’s guess how I came to know about this product….yep, yet another food blogger who was sharing pictures last week from a food blogger event to promote “Danone Greek Yoghurt”. Even after unfollowing many popular food bloggers, there are still a few lurking around in my Instagram timeline promoting such junk without any conscience. When brands launch junk foods with taste as their promise, I don’t care much, but if they use “health” as part of their promotions, then I had to check out the ingredients and of course, I had to write about it. First, what is Greek Yoghurt? Why there are so many brand launches in the past year - Nestle’s Grekyo, Epigamia and now Danone? Greek Yoghurt is made using the similar milk fermentation process followed for making regular yoghurt. It is then strained to remove liquid whey, leaving behind a thicker, creamier yoghurt. Given the “high protein” craze that has taken over the urban, “health-conscious" population, it is no wonder that so many brands of Greek Yoghurt are lined up in the supermarket shelves. It is promoted as a high protein snack with real fruit pieces. What a pickup line for parents who wish their kids eat real fruit !! Blueberry is only 5% of the total ingredients. Given the huge cost of imported blueberries, we can’t expect more quantity. The purple colour is from the “grape juice concentrate”. Unless you read the ingredients list in tiny font, you won’t be able to guess it. Take a look at sugar that is listed TWICE. As per the nutritional information, it contains 12 gm of sugar per 100 gms, which means the 80 gm pack has around 2.5 tsp of sugar. Let’s also look at the promise of "High protein" - The 80 gm pack has a measly 4.8 gm of protein. A typical Indian vegan meal provides us with enough protein. We don’t need such cleverly marketed sugar-loaded junk foods that cling onto latest diet fads. Apart from sugar being repeated twice, there are also additives such as stabilizer, preservative and artificial colour. This pack is also loaded with sugar - 14.4 gm per serving size (around 3.5 tsp of sugar). % GDA per serve shows 16% next to sugar. “Guideline Daily amounts (GDA) of an average adult. Servings should be adjusted for children of different ages"
Who eats flavoured yoghurt mostly - our innocent children for God’s sake. Imagine the sugar overload on them, if they gobble up an entire pack. It’s not just with the recently launched Greek Yoghurt brands. Check out any flavoured yoghurt and you would notice the obscene amount of sugar - 13 gm in Danone mango flavoured yoghurt (which translates to 3.25 tsp of sugar). I have seen many parents loading their shopping carts with 6 packs of flavoured yoghurt every week. Let’s stop this craze towards milk and milk based products. Our children can get enough protein from cereals, lentils, nuts and seeds. Some of you had asked me to include the newly launched Epigamia as part of this article. I finally managed to take a look at Epigamia flavored greek yoghurt that’s been promoted big time by food bloggers. It is marketed as a “high protein, low fat snack”. 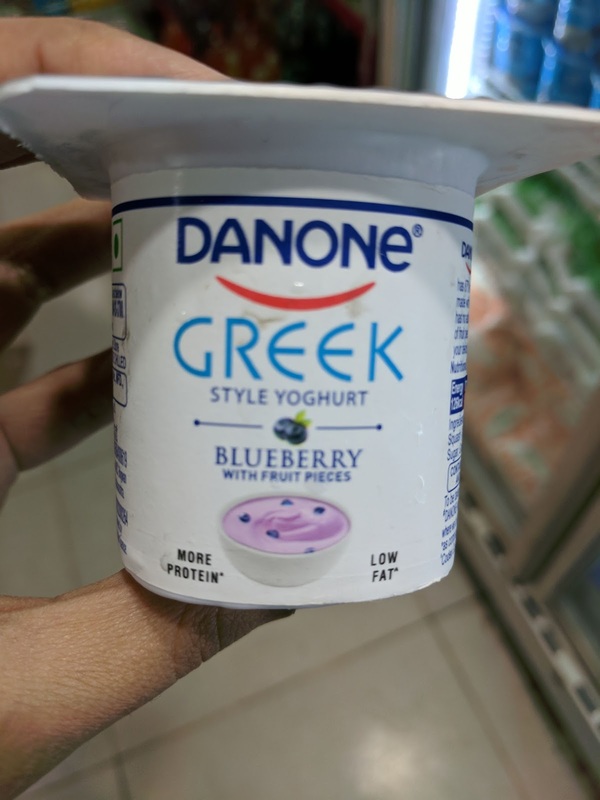 The 90 gm serving pack of blueberry flavoured version has around 6.68 gm of protein which is slightly higher than that of Danone (4.8 gm of protein). 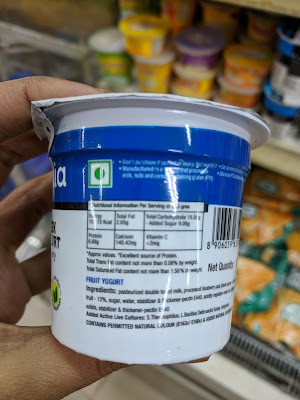 The unflavoured, Epigamia “natural" greek yoghurt has 8.21 gm of protein. Let’s compare the protein value with healthy plant-based vegan foods. Apart from protein, these foods provide good fats, vitamins and minerals. 100 gm of puffed rice (pori) contain 7 gm of protein WITHOUT any added sugar, whereas Epigamia blueberry flavoured greek yoghurt comes with 8 gm or 2 tsp of sugar. 1) The quantity of black grapes is higher than that of blueberries. 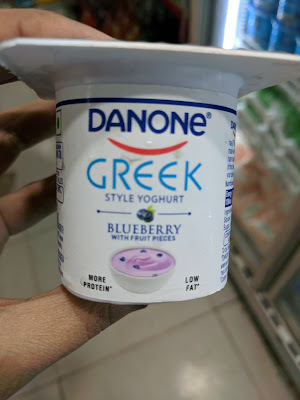 So ideally, it should have been named "black grapes flavoured greek yoghurt”, but that doesn’t really give a premium feel to the product like “blueberries”. 2) Pectin (E440) is derived from natural sources and used as a thickening agent in jams, jellies and sauces. Large quantities of consumption may cause intestinal discomfort or flatulence. 3) Malic acid (E296) can be made either synthetically or derived from fruit. Research says that infants and young children should avoid it. High concentrations are not permitted in infant food, as small children lack the capacity to metabolise large amounts of malic acid. I have no clue about the processing required to extract these colours. Thank you Sundhara....Green tea is overhyped too. Unless there is an independent research, we won't be able to know its authenticity or quality. Many people fall for it, thinking that drinking green tea 4-5 times a day will help them lose weight. Harshitha, Will check out epigamia when I come across it. @Harshitha, I have updated the post with Epigamia. Do check it out. Green Tea is no good for health for sure. Excellent write-up! It would be great if you could tell us your opinion about swapping indian curd with unflavored greek yoghurt to reduce the carb intake. Hello! This is an eye opener. Could you also write about 'Yakult'?